The BM-8-24 is premium Rank I Soviet tank destroyer with a battle rating of 2.3 (AB/RB/SB). The tank was added in Update 1.53 "Firestorm". It is a T-60 chassis carrying Katyusha rocket launcher that can fire 24 rockets towards the enemy. Ammo racks of the BM-8-24. 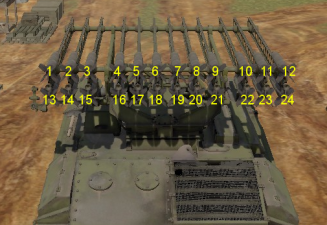 Rockets deplete right to left from bottom to top, but ammo rack don't change until empty. Small rocket supply of only 24. Very poor depression can cause it to be problematic to hit low targets at close ranges. The concept of a multiple rocket launcher system came about in June 1938, when the Soviet Jet Propulsion Research Institute was authorized by the Main Artillery Directorate to develop such system for the RS-132 rocket in use on their aircraft. A prototype by I. Gvay in Chelyabinsk was tried and fired M-132 rockets on ZiS-5 trucks, though these were unstable and were revised on the proposals of V.N. Galkovskiy to mount the launching rails longitudinally. Testing for the newly made prototype began at the end of 1938, firing 233 rounds in a couple of salvos. The rockets were found to be able to hit up to 5,500 meters out, but the system was not looked fondly upon by the artillery branch. It took 50 minutes to load 24 rockets onto the launching rail, while a regular artillery cannon and howitzer can fire about a hundred in the same time at a sustained rate. Testing continued up until 1940 and with a prototype of a truck with the launch rails on the back. The design was approved for production before Germany invaded the Soviet Union in June 1941, and mass-production began after the first month of the war, where the multiple rocket launchers proved very successful. During the war, the launchers were taken with much secrecy and operated by specialized troops such as the NKVD who do not even know its true name. Through the presence of a "K" on the vehicles from the Komintern Factory, the soldiers operating decided to nickname these launchers "Katyusha" after a popular wartime song of the same name. Up to 3,237 of all types of Katyusha launchers were produced from 1941 to the end of 1942, and more than 10,000 were made by the end of the war. Compared to the contemporary artillery systems of the time, the multiple rocket launcher system presented a different kind of artillery barrages used in the field. Advantages the multiple rocket launcher was that they were simple, extremely effective in saturation bombardment, fires lots of ordnance in a small time span, and were usually attached to mobile vehicles that can permit a quick retreat after firing to prevent counter-battery firing. Disadvantages with the system was that the rockets took a long time to reload, less accurate than regular artillery guns, and cannot sustain fire for a long period of time. However, in the battlefield, the multiple rocket launcher induces a greater psychological effect onto the targets on the receiving end due to the heavy amount of explosives able to be delivered in a short time. A battery of only four launchers could deliver their salvos of about 4.35 tons of explosives in a span of no longer than 10 seconds at a 400,000 square meter area. Multiple variants of the multiple rocket launcher system were made in the course of the war as the design is simply the attachment of launch rails onto a variety of vehicles. Each vehicle has different names that follows a template to distinguish their types. "BM-x-y" indicates a ground vehicle. "M-x-y" indicates a towed variant. "y-M-x" indicates a naval variant. and "x" stands for the missile model while "y" stands for the number of launch rails available for the launcher variant. For example, the BM-8-16 indicates a ground vehicle firing M-8 rockets with 16 rails available to mount on. 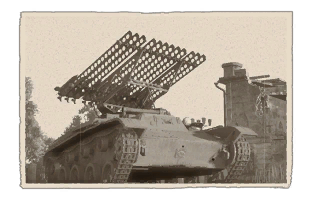 Vehicles using the Katyusha launchers range from trucks, cars, and tanks. The production started with trucks such as the ZiS-6, then moving on to STZ-5 artillery tractors, then on Allied Lend-Lease vehicles. The 82 mm M-8 rockets, which saw service in August 1941, was the most popular rocket variant and saw use on the trucks and even tanks, which would make the BM-8-24 rocket launcher tank mounted on the T-60 light tank. Another attempt with tank mounting was with a KV-1 heavy tank as the KV-1K, but as a waste of heavy armour, this was scrapped. The Katyusha rocket launchers first saw service during the opening of Operation Barbarossa against Germany. On July 14, 1941 under the experimental battery commanded by Captain Ivan Flyorov, seven launchers were used in Rudnya and were able to cause massive destruction to the Germans in he town before they fled in panic. This success prompted the Red Army to build up more Katyushas in their inventory and raise more batteries and regiments for the vehicle. All these units were under NKVD control for secrecy until the Germans reveal their own multiple rocket launcher system, the Nebelwerfer. The Germans nicknamed the Katyusha launchers as the "Stalin's Organ" after Joseph Stalin and how the launchers are organized in a way to look like church organ. This German nickname became widely known in other areas in Western Europe. By the end of 1941, eight regiments and 37 independent battalions were available with a count of 554 Katyushas total. The rocket launchers continue to become more integrated into the rest of the army as the war continued. Heavy mortar battalions were armed with the newer M-30 rocket launchers with heavy 300 mm M-30 rockets on June 1942. In July, a battalion of rocket launchers were added into the tank corps. The organization and equipment of these mortar battalions equipped with the Katyusha continue to increase and by the end of the war in 57 regiments, about 518 batteries of Katyusha launchers were available. The Katyusha launchers, issued in large numbers in the Eastern Front, was largely successful in the strategic effect of the war, granting the Soviet Union the ability to lay down a very heavy and shocking bombardment very quickly. The success of the system prompted many other countries to pursuit such a system as well, such as the modified T34 Calliope based off the Sherman and the Germans Panzerwerfer 42s. Today, the multiple rocket launcher system is still widespread with the implementation of newer technology, rockets, and missiles that makes the rocket launcher system a very potent weapon to anyone on the receiving end. 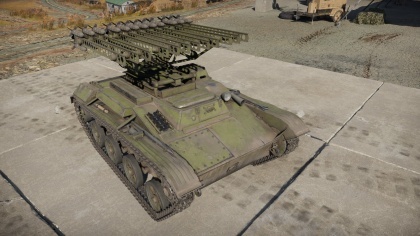 Skin and Camouflages for the BM-8-24 in Warthunder Live. This page was last edited on 5 April 2019, at 00:56.